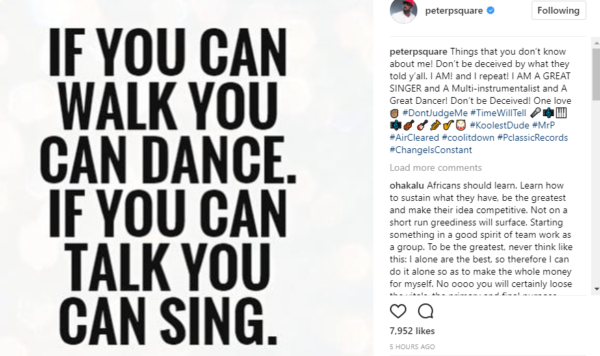 P'square’s Peter Okoye is here again to tell you what he can do, this time, he is bragging about being a great singer, multi-instrumentalist and a great dancer. You recall, during his bare it all interview last year, Psquare Peter Okoye revealed he was betrayed by his twin brother Paul when he realised Paul had told the Mavins crew that he, Peter, doesn’t sing or write songs. I felt really bad and betrayed, but I covered up for him. I jokingly asked Teebillz if they gave him Red Label and he said yes, so I was like you guys caused it, and we laughed over it.